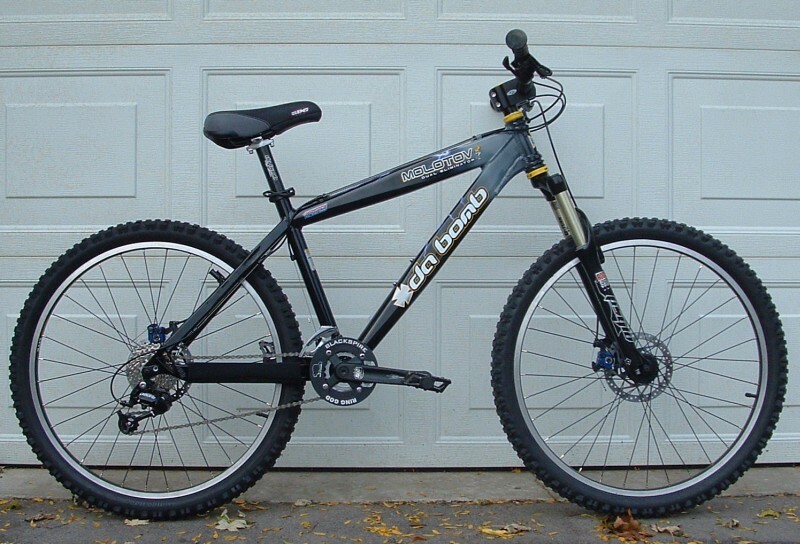 is the da bomb mindbomb a good all around bike?I saw one and might buy it if i sell my bike in time.Is it a good all around bike? i broke my mindbomb pretty badly. i think my mechanic said he found 10 cracks. yeah im pretty oblivious. but i got a iron horse world cup now so its all good. What about the Moab Bomb? Just like a Kona but with a horst link rather than a mono-pivot. Where is Da Bomb based actually? Is it a Canadian company? European? I love my new Da Bomb Molotov. 16" frame, 33lb total weight, and even though I don't do any dual slalom or 4X, it seems perfect for light free riding, urban, dirt jumping, and street riding - exactly the versatility I am after. And the short wheel-base and small frame is great for some trials type moves, popping up the front wheel, moving the bike around in the air, and doing other tricks. 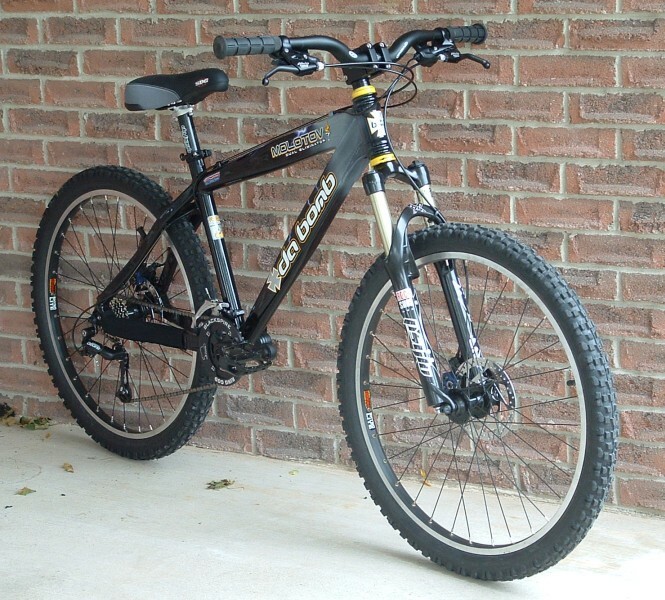 I'd say that the dual slalom style of hardtail is great for all kinds of riding. Components: RockShox Psylo XC U-Turn fork adjustable from 80-125mm for different conditions, eyeletted Rhyno Lite rims, Kenda Kinetic tires, 6" mechanical disc brakes, Deore drivetrain, FSA AlphaDrive crank with Blackspire RingGod bashguard, VP-550 Alloy BMX style platform pedals, SDG Freestyle seat, FSA "The Pig" Headset, Pazzaz handlebars, OURY Mountain Bike Grips, plus a lovely lightning paint job! The picture below is unfortunately somewhat dull because of the dark weather, and doesn't do the bike justice. Whaddyathink? this thread is like 2 months old. 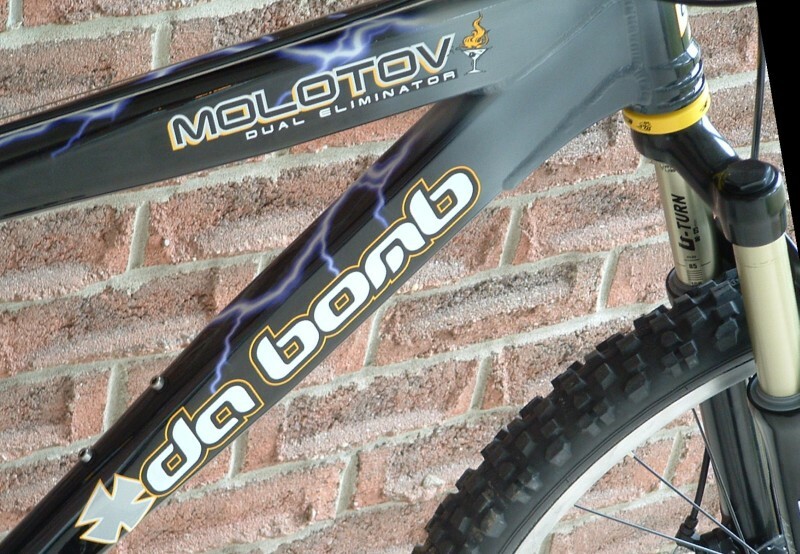 I really love the special edition "lightning" paint job on my Da Bomb Molotov too! i really really like my mindbomb.. its awesome.